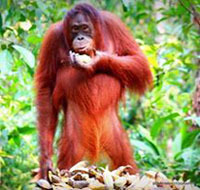 We will welcome you to visit the magical island and exotic Apes called "Orangutan". 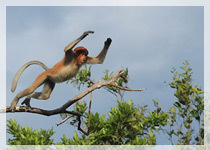 One of ape live in Asia between Borneo and Sumatera island . Your fascination journey is cruise the river and observe some mokeys move from tree to another tree along Sekonyer river . Orangutantravel.com is one of the major Borneo Indonesia, Kalimantan local tour operator, specialist handling group as well as private arrangement. We would like to remind you that our tour is very aware of animal and protect their habitat from deforestation, we remind you to help minimize this in order our wildlife can be live longer. We would like to invite you to visit orangutan in Tanjung Puting National Park is the best place to see orangutan so close. And invite you to explore borneo island and unigue culture . Borneo Hijau Travel is one of the tour operators that promoted wildlife, culture, and other interesting place around Borneo. Our Packages tour are designed with carefully and consideration of safety. We offer the tour as your request in the itinerary and enable you chose another tour around Indonesia. We had handled many countries that join with our tour around Borneo and Indonesia generally. Experienced as tour field guide, responsible, humorist and more talented and knowledge some primates, birds, culture and ecology of Borneo,good personal and ability in English. Orangutantravel.com is on line marketing 24 hours. Our packages are : Indonesia eco tour, Borneo orangutan tour, Borneo dayak Adventure, Shooting Film, Photographer, Bird watcher, Leisure, FIT, Group and International Event and National Event. Ornagutantravel.com are prepare some Speaking guide, such as Spanish , France, Japanese, German,Italy,Chiness, Korea, Rusia,andDucth speaking guide. Orangutantravel.com is also sevice for flight booking such as Garuda, Merpati, Lion air, Wing Air, Mandala Air , Sriwijaya Air, Batavia Air, Trigana Air, Riau Air, Linuas Air all around in Indonesia.